A waffle iron is a cooking appliance used to make waffles. It usually consists of two hinged metal plates, molded to create the honeycomb pattern found on waffles. The iron is heated and either batter is poured or dough is placed between the plates, which are then closed to bake the waffle. Professional waffle makers are usually made of cast iron whereas domestic models are often teflon coated. Many have a light that goes off when the iron is at the set temperature. Most modern waffle irons particularly cast aluminum ones are coated with a non stick coating to prevent the waffles from sticking to them. Cast iron waffle makers are usually not coated and require seasoning like a cast iron frying pan. 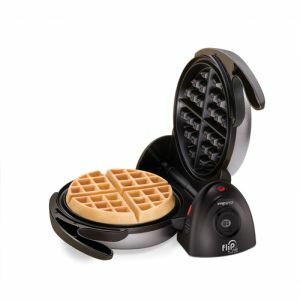 Modern waffle iron makers offer a large variety of choices. Some waffle irons can make a very thin waffle, capable of making waffle cones or Pizzelle. While there is no set standard of classification for waffle shapes or thicknesses, models that fall within the most common shapes and thicknesses are often labeled as "traditional" or "classic".